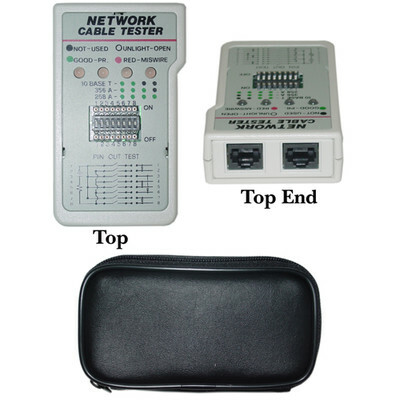 It is designed to quickly test the most popular network cable wiring that using twisted pair, such as 258A eight wire system specified by AT&T or 10 BASE-T Ethernet standard. Just press one button switch, then you may know the cable continuity. To learn more about the pin-out correction of each pair, it was equipped with a set of DIP switch and jumpers, which allow you to test the pin-out status or rewired as you want by using jumper wires. More Product InfoThis network cable tester is designed to quickly and accuratly test some of the most popular network wire set-ups such as 258A, which is the eight-wire system specifid by bAT&T networks as well as being the 10Base-T standard. The Cable Tester worked just as described. This unit makes it simple to check a Network cable I repaired. Every item I have ordered from CableWholesale has worked as described and worth every cent.